Technologies have begun to bring the state sponsored violence meted out to black people to a larger consciousness. This violence has been long known to black and poor people, but it is now present to the dominant culture. You can see a video, repeatedly (or even as a background image) as two people discuss a man being strangled or shot. To death. The prohibition of showing the deaths of victims is waived when the victim is black. Their last words are broadcast. Their bodies left in the street as a warning, or as a provocation. You cannot imagine seeing the victims of Columbine or hearing the tapes of Sandy Hook, but for some reason, you can see a black man killed in on your television. You can sit in a pub, a waiting room, your well appointed home with its flat screen tv and see someone killed. These images are public and private and downright quotidian. I chose to make work that marries contemporary and historical violence to the domestic impulse. Publicly created and shared photographs of violence against black people now inhabit contemporary frames. 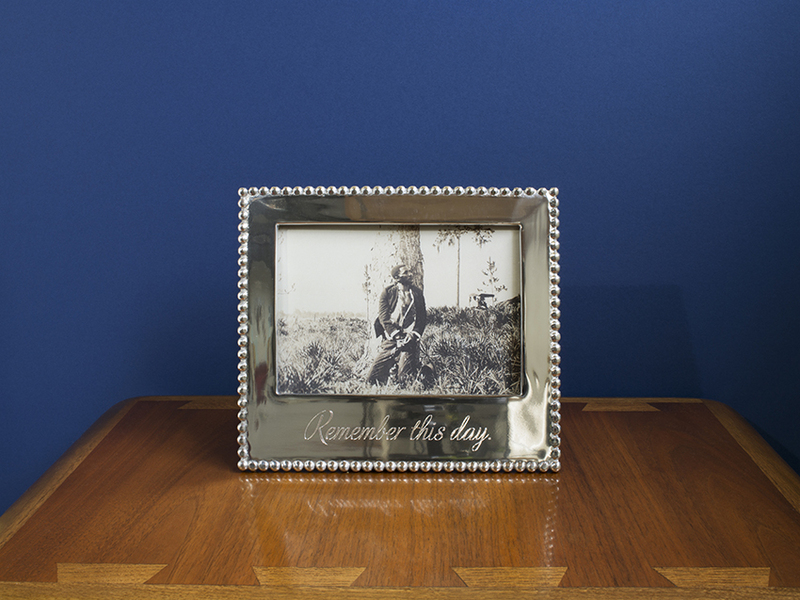 Using frames designed for keepsakes or familial milestones, siting these on a 1960s era Andre Bus coffee table against various hues, the work reconciles a violent history with the contemporary spectacle of state violence within a domestic sphere. They are the obscene excess of the spectacle of violence played out in public for consumption and control. Family Pictures was first exhibited at Gallery Kayafas in Boston October 21-November 26, 2016. I have deep gratitude to Arlette Kayafas for allowing me to show this work with her. In addition, we created a "reading room" in a section of the gallery, with texts that directly influenced Family Pictures. The neon was designed by me and Carmine Saccardo and fabricated by Carmine at NENeon. Family Pictures was shown in New Orleans, Louisiana in P.S. Satellites a project of Prospect. 4: The Lotus in Spite of the Swamp. November 18, 2017 - February 25, 2018. The work was installed in the Backyard of a home in the Tremé, I am deeply grateful to Lauren, Harry and Sebastian Alvarez for allowing their home to be the host for this work.